In this review article will I will list down the Best Bicycle for Girls in India. I will cover cycles that will suit girls of all age group. Bikes that they can use starting when they are 1 year old right up to teenagers. This article will only list the top products in each group along with their prices. I am not a firm believer of “Pink for Girls”. However, I do understand that a lot of girl child do like pink or shades of pink (I have grown up with a younger sister 🙂 – Hence I know this first hand ). So I have included pink as well as products with neutral colours. Note – If you are looking for an adult bicycle, visit the article on Best Ladies Bicycles in India. Read on, if you are looking for kids bicycle. Also, whichever product you buy, don’t forget to buy an appropriate safety gear for your kid. It does not matter if your kid cannot ride a bicycle right now or if he is too slow to get hurt. What is more important is that you make them learn to take proper safety precautions as they starting off. I suggest buying this helmet for your child. You have two types of cycles to choose from for your toddler girl. The first option you have is to go with the popular choice of tricycles. While the second option is to go with a balance bike. You princess might not like the balance bike on the very first day, but trust me, eventually, you will find her racing around the house on her newly found love. Even though, I prefer balance bikes. The choice is up to you to choose the right product for you kid. I will provide you with the best options in both these categories. This is the best tricycle that you can buy in India (vis-a-vis the price you pay for it). This R for Rabbit Tricycle is En 71 (European Standards) certified for safety. The product comes with a safety bar, which can also be used by the child to hold on to. If you don’t have a stroller yet or if your kid does not like the closed space of a stroller, this can be the perfect product for you. R for Rabbit also has simpler and more budget-friendly models to offer. View the entire range using the link below the image. However, as I said earlier, the product that I prefer is a Balance Bicycle. View the product below for a recommendation. Suggested Read – Best Tricycles in India. I believe, Balance bike makes the kids more independent & confident in their abilities. They also help your child in learning riding a bicycle at a much earlier age. As a parent, it helps you as don’t have to run around much behind your kids while teaching them to ride. As they already know how to keep their balance on a bicycle, they start pedalling with ease in a few days. Depending upon the height of your little girl, she can start using it once she is about 2 to 3 years old. Again, depending upon her height, this bicycle should last her till the time she is about 5 years old. As you would have guessed by now, I really like R for Rabbit products, they are well made and safe product for your kids. Although slightly expensive compared to other products on the market. But if you can afford the difference, I will surely recommend buying this brand. Just have a look at the build quality and the design of the product. If you think a 14 Inch tyre cycle will be slightly larger for your girl then you can opt for BSA Champ Ringo. This particular bicycle has 12 Inch wheels. This product does not come with any fancy features like the one above. However, it is a good basic bicycle. 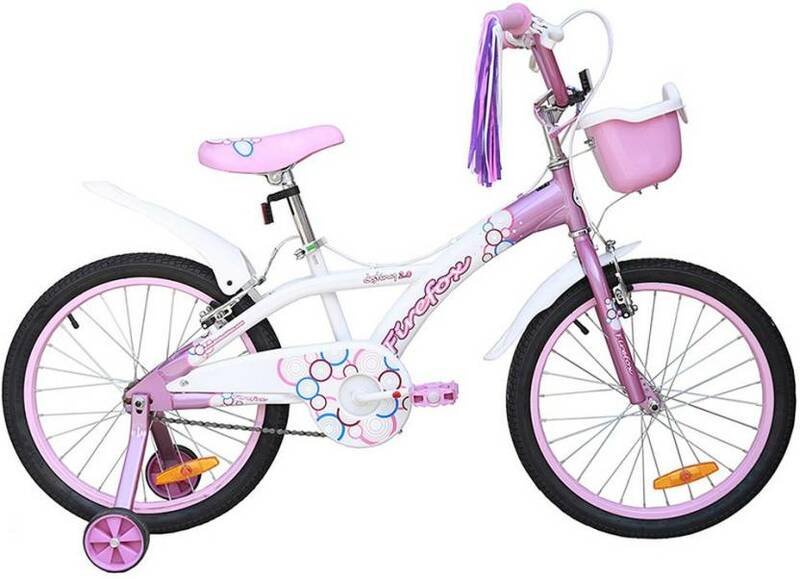 Little girls will generally find the pink and white combination of this bike attractive. A really good option for girls aged around 5 years old. Hero Cycles is a well know brand and is known for quality products. This bicycle comes with a lot of extras like the luggage carrier on the back and a basket on the handle. The bicycle has good Disney inspired stickers/decals and attractive colours. Ahh, R for Rabbit again! This might look exactly like the product I discussed above. However, trust me there is some difference. The product above had 14 Inch tyres and was a right product for kids around 3 to 5 years old. This particular model has 16 Inch tyres and is a right fit for kids in the age group of 5 to 7 years old. As I have already covered this product above, I will not go into the details of this product. However, the image above should help you recollect the features of this cycle if need be. If your child is slightly older or has good height, you can consider going for a bicycle with 20 Inch wheels. This bicycle should last your kid till they are around 10 to 12 years old. You can then upgrade them to a bigger frame as per their needs then. This is a good product from Firefox Brand of cycles. This product is a bit expensive but if you want you kids to spend more time outdoors, you will need to buy the products that they like and enjoy. However, I understand that a lot of parents do not wish to buy bicycles with gears for their kids. If you or your kid is not too keen on buying a geared bicycle, you can consider the product below. This is a single speed model from Firefox. It also has a rigid frame unlike the model above. Considering these two main difference, the price of the bicycle is also accordingly lower compared to Firefox Alfa above. For girls above 12 years of age, I will recommend you buy a proper ladies bicycle. Kids grow really fast and they should be able to adapt to a slightly bigger frame for a few days (If need be). I will recommend you to either buy Mach City iBike W or one of the Lady Bird models. This brings me to an end of my review of the Best Bicycle for Girls in India. If you wish to read my generic article and also know about the factors to keep in mind, you can refer to my article on Bicycle for Kids. I hope you were able the select the right product for your girl child. If you have any further questions, do feel free to ask them in the comments section below. I will try and answer them as soon and as accurately as possible.